What do the movies Fast Five, X-Men: First Class, and The Hunger Games all have in common? Aside from each film being a major blockbuster, all of these films were shot in the southern state of Georgia. Georgia attracts its fair share of major productions because of the generous film incentives it offers; however, you might be surprised to learn many of today’s up and coming names in animation, media production, and video game production also hail from Georgia. This is due, in part, to the many top tier animation colleges that call Georgia home. Just a few other major films that were filmed, all or in part, in Georgia include: Sweet Home Alabama, Glory, and Forrest Gump. In fact, Georgia boasts the fourth largest entertainment industry in the country with more than 30,000 workers involved in animation and film and slightly over 800 television and film projects in the works. In 2014, the economic impact of film and animation in Georgia totaled $5.1 billion dollars. Each one of these industries relies on the expertise and creativity of animators. There is also a rapidly growing secondary market for individuals who can teach the craft of animation in universities and colleges, as well as secondary and elementary schools. Animators can earn an attractive salary in the state of Georgia. According to Salary.com, a mid-tier animator can earn an annual salary of $53,000.00 per year, not including bonuses and benefits. However, with the world class education an animator receives at a Georgia animation school, they will be qualified to work anywhere in the world. 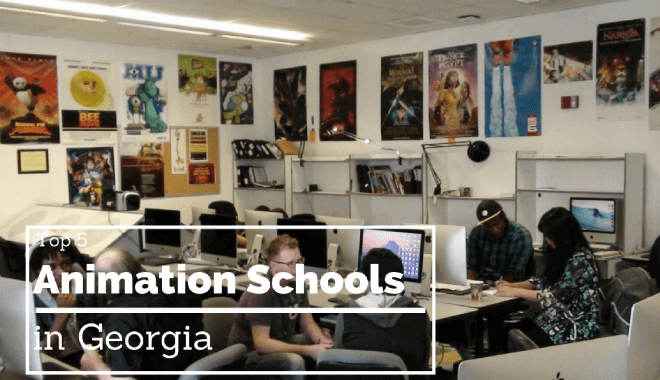 What are the top Georgia Colleges for aspiring animators? Anyone who majors in one of these fields is also eligible to earn their professional certification as an Animation and Game Design Specialist TCC. The goal of this certification is to equip graduates with the tools they need to create dynamic and rich content. 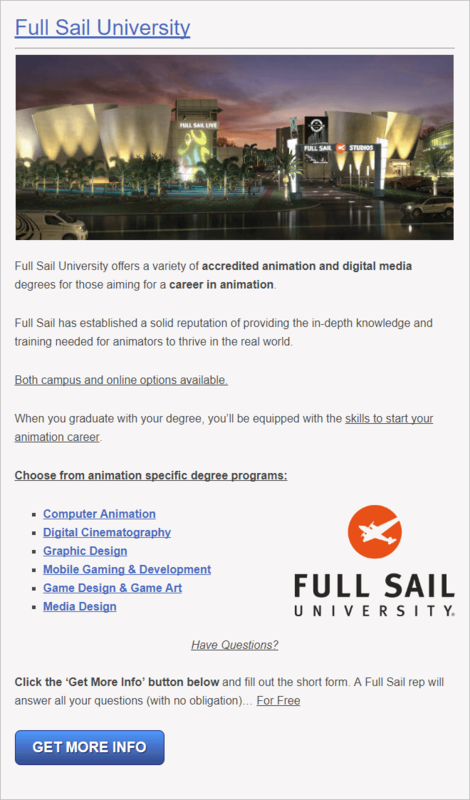 Graduates will be capable of targeting specific audiences, creating style guides, screen packages, and design print that will qualify them to work in the unique fields of production art, game animation, film animation, and website design. It is worth mentioning that, although most of these courses focus on animation, students will be introduced to other areas of game development, like storyboarding and game production pipelines. The curriculum offered by Central Georgia Technical College is designed to prepare students for employment within a diverse range of media production industries, including animation. The program maintains a heavy emphasis on production in Motion Graphics. The program that students will enter for this two-year degree is comprehensive. Faculty members will guide students through a carefully designed, demanding program that meets and exceeds the criteria demanded by today’s gaming development and simulation professionals. The classes included in the curriculum incorporate industry standard models in modeling, design, computer programming, creative writing, and animation techniques. Students may also expect to gain a thorough knowledge of creative and visual arts, in addition to video and audio technology. About: Chattahoochee Technical College recently introduced its Design and Media Production Technology program, which enables graduates to earn an Associates of Applied Science degree in this field. CTC understands the critical need to keep abreast of the latest technology in a rapidly growing and evolving industry. Subsequently, students will work with the latest versions of the software used in modern production, which includes Unreal Engine, GameMaker, and Adobe Master Collection, amongst others. A BA in animation from SCAD requires of a total of 180 hours of study, and before a student is allowed to enroll in classes for their major, they must first pass a rigorous core curriculum of general education courses and foundation studies that are focused on developing key communication skills and critical thinking abilities. What makes SCAD stand out from other animation colleges is the wide range of internships and externships they offer to their students in order to enable them to prepare for the workforce. Students from SCAD have gone on to work for top-tier companies, like Disney, Fisher Price, Vicarious Films, and Bento Box Entertainment. About: Students who are serious about obtaining an animation degree from an internationally acclaimed university will find what they are looking for at the Arts Institute of Atlanta. AIA currently offers a highly coveted Bachelor of the Fine Arts degree in Media Arts and Animation. In this program, students will create a strong foundation in design, drawing, and illustration in order to create works in a traditional 2D format. After mastering this practice, they will then move on computer generated 3D formats, which are used to infuse life into objects and characters. Graduates of the program are equipped to obtain entry-level employment as computer animators, traditional animators, digital media producers, background designers, layout artists, video game creators, and special effects artists. As courses advance in complexity, students are afforded the opportunity to become proficient with program-specific software, like AutoDesk Maya, Adobe Photoshop, 3D SMAX, and Adobe AfterEffects. Upon completion of the program, students are provided with the chance to take a series of portfolio courses in which they devise and execute special projects that create an integral foundation for their digital portfolios. These portfolios can then be used to showcase their unique skills to prospective employers.